―MetalBeard in The LEGO Movie. 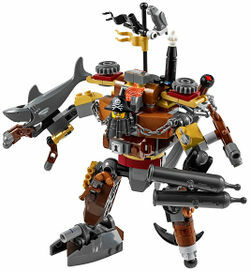 MetalBeard is a character that appeared in The LEGO Movie in 2014. He is a pirate obsessed with revenge on Lord Business for taking his body parts. It is also revealed that he built his suit from scratch. He is voiced by Nick Offerman. He is the captain of the colossal pirate ship The Sea Cow. His face printing is similar to that of the Hockey Player from the Minifigures theme, but with an eye-patch and "metal" tooth. His minifigure appearance has the same torso as the Pirate Captain. His crew consists of the Magician, Speed Racer, The Flash, Disco Dude, a female and male Pirate, a Witch, a Mime and Medusa. This page was last edited on 27 June 2016, at 16:42.